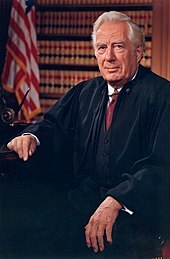 The Burger Court refers to the Supreme Court of the United States from 1969 to 1986, when Warren Burger served as Chief Justice of the United States. Burger succeeded Earl Warren as Chief Justice after the latter's retirement, and Burger served as Chief Justice until his retirement, at which point William Rehnquist was nominated and confirmed as Burger's replacement. The Burger Court has been described as a "transitional" court which continued the liberal legacy of the Warren Court but transitioned into the more conservative Rehnquist Court. A symbol of the conservative "retrenchment" promised by President Richard Nixon in the 1968 election, he was often overshadowed by the liberal William Brennan and the more conservative William Rehnquist. The Burger Court had a less generous interpretation of the protections offered by the Fourth Amendment and the Fifth Amendment than those of the Warren Court, but the Burger Court did not overrule any of the major precedents set by the Warren Court. In 1969, President Richard Nixon appointed Warren Burger as the replacement for the retiring Earl Warren. Warren had attempted to retire in 1968, but President Lyndon Johnson's nomination of Associate Justice Abe Fortas as Chief Justice was successfully filibustered by Senate Republicans. Fortas resigned from the court in 1969 following an ethics scandal, and Burger was confirmed the next month. The Burger Court thus began with Burger and seven veterans of the Warren Court: Hugo Black, William O. Douglas, John Marshall Harlan II, William Brennan, Potter Stewart, Byron White, and Thurgood Marshall. Nixon attempted to fill Fortas's vacant seat, but Nixon's nominations of Clement Haynsworth and G. Harrold Carswell were both voted down by the Senate. Fortas's replacement, Harry Blackmun, was finally confirmed in 1970; the 391-day vacancy was the longest since the 1860s. Black and Harlan both died in 1971, and Nixon replaced them with Lewis Powell and William Rehnquist. In 1975, Douglas stepped down from the court, and President Gerald Ford appointed John Paul Stevens to replace him. In 1981, Stewart retired, and President Ronald Reagan appointed Sandra Day O'Connor to replace him. O'Connor was the first woman to serve on the Supreme Court. The era of the Burger Court ended in 1986 when Burger retired. He was succeeded as Chief Justice by William Rehnquist, who was elevated to the position of Chief Justice by President Reagan. Lemon v. Kurtzman (1971): In an 8-1 decision written by Chief Justice Burger, the Court struck down a state law that allowed school superintendents to reimburse Catholic schools for the salaries of teachers. The court held that this violated the Establishment Clause, and the court created the "Lemon test" to determine whether a law is constitutional under the Establishment Clause. New York Times v. United States (1971): In a 6-3, per curiam decision, the court allowed The New York Times and The Washington Post to publish the Pentagon Papers. In so doing, the court placed the concept of freedom of the press above the Nixon Administration's claimed need to keep the papers secret for national security purposes. Roe v. Wade (1973): In a 7-2 decision written by Justice Blackmun, the court held that the right to privacy under the Due Process Clause extended to a woman's decision to have an abortion. The opinion struck down several state restrictions on abortion, and the opinion remains a major part of an ongoing debate regarding abortion. Miller v. California (1973): In a 5-4 decision written by Chief Justice Burger, the court laid out the Miller test, which the court continues to use as a definition for obscene material. The court held that First Amendment protections extend only to non-obscene material. United States v. Nixon (1974): In an 8-0 decision written by Chief Justice Burger, the court rejected President Nixon's claim that executive privilege protected all communications between Nixon and his advisers. The ruling was important to the Watergate scandal, and Nixon resigned weeks after the decision was delivered. Regents of the University of California v. Bakke (1978): No single opinion was able to win a majority of the court's vote in this case. Nonetheless, Bakke upheld the usage of affirmative action in college admissions while disallowing the use of racial quotas. Bob Jones University v. United States (1983): In an 8-1 decision written by Chief Justice Burger, the court allowed the Internal Revenue Service to remove the non-profit classification of Bob Jones University due to the university's policy of racial discrimination. In doing so, the court held that IRS could deny non-profit status on the basis of compelling government interests. Although Presidents Nixon, Ford, and Reagan all criticized the rulings of the Warren Court and sought to appoint conservative justices, the legacy of the Warren Court remained strong throughout the 1970s. The Burger Court upheld many of the precedents of the Warren Court, even in regards to due process and criminal law. The latter era of the Warren Court was dominated by liberal justices, but the court shifted to the right early in 1969, following Nixon's appointments. Brennan and Marshall generally took liberal positions, while Stevens (after he replaced the liberal Douglas in 1975), Stewart, and White often took centrist positions, and Rehnquist, Burger, and (to a lesser extent) Powell made up the conservative bloc of the court. During his time on the court, Blackmun shifted from the right towards the center, allowing liberals to claim more victories as the 1970s continued. However, the conservatives on the court were strengthened in 1981 when Stewart was replaced by the more conservative O'Connor. Nonetheless, Justice Brennan was often credited for winning the votes of the more centrist judges with his intellectual leadership. The large number of moderates on the court and the resulting decisions gave the court a paradoxical reputation for being both conservative and liberal. Although Burger was often overshadowed by the intellectual leadership of Brennan and Rehnquist, he earned a reputation as important judicial administrator who helped to create institutions such as the National Center for State Courts. Burger also often questioned the need for a judicial remedy in cases; Burger was a strong believer that courts could not cure all injustices, and Burger was not reluctant to limit the standing of plaintiffs. ^ a b c d e Greenhouse, Linda (26 June 1995). "Warren E. Burger Is Dead at 87; Was Chief Justice for 17 Years". The New York Times. Retrieved 28 February 2016. ^ Arenella, Peter (27 June 1986). "Burger Court Took a Different Road : It Let Other Goals Supplant Fairness in Individual Rights Cases". LA Times. Retrieved 28 February 2016. ^ Desilver, Drew (26 February 2016). "Long Supreme Court vacancies used to be more common". Pew. Retrieved 3 March 2016. ^ "The Burger Court, 1969-1986". The Supreme Court Historical Society. Retrieved 28 February 2016. ^ a b Gillers, Stephen (25 September 1983). "BURGER'S WARREN COURT". The New York Times. Retrieved 28 February 2016. ^ Alschuler, Albert (1986). "Failed Pragmatism: Reflections on the Burger Court Commentaries". Harvard Law Review. 100 (1436). Retrieved 28 February 2016. ^ a b c d Galloway, Russell (1 January 1987). "The Burger Court (1969-1986)". Santa Clara Law Review. 27 (1). Retrieved 28 February 2016. ^ Sitomer, Curtis (7 July 1986). "Burger court: activism mixed with restraint. Court under Nixon appointee defied facile characterization". Christian Science Monitor. Retrieved 29 February 2016. Blasi, Vincent (1983). The Burger Court: The Counter-revolution that Wasn't. Yale University Press. ISBN 9780300036206. Graetz, Michael J.; Greenhouse, Linda (2017). The Burger Court and the Rise of the Judicial Right. Simon and Schuster. ISBN 9781476732510. Lamb, Charles M. (1991). The Burger Court: Political and Judicial Profiles. University of Illinois Press. ISBN 9780252061356. Maltz, Earl M. (2000). The Chief Justiceship of Warren Burger, 1969-1986. University of South Carolina Press. ISBN 9781570033353. Schwartz, Bernard (1998). The Burger Court: Counter-Revolution or Confirmation?. Oxford University Press. ISBN 9780195352733. Yarbrough, Tinsley E. (2000). The Burger Court: Justices, Rulings, and Legacy. ABC-CLIO. ISBN 9781576071793. Hirshman, Linda (2015). Sisters in Law: How Sandra Day O'Connor and Ruth Bader Ginsburg Went to the Supreme Court and Changed the World. HarperCollins. ISBN 9780062238481. Hutchinson, Dennis J. (1998). The Man who Once was Whizzer White: A Portrait of Justice Byron R. White. Free Press. ISBN 9780684827940. Jeffries, John Calvin (2001). Justice Lewis F. Powell, Jr. Fordham University Press. ISBN 9780823221103. Jenkins, John A. (2012). The Partisan: The Life of William Rehnquist. PublicAffairs. ISBN 9781586488871. Murphy, Bruce Allen (2003). Wild Bill: The Legend and Life of William O. Douglas. Random House. ISBN 9780394576282. Stern, Seth; Wermiel, Stephen (2010). Justice Brennan: Liberal Champion. Houghton Mifflin Harcourt. ISBN 9780547523897. Williams, Juan (2011). Thurgood Marshall: American Revolutionary. Crown/Archetype. ISBN 9780307786128. Schwarz, Bernard (1995). A History of the Supreme Court. Oxford University Press. ISBN 9780195093872. This page was last edited on 17 January 2019, at 21:22 (UTC).